The story of the game follows a mech-suited human named Jake fighting a bunch of alien species called XADA. 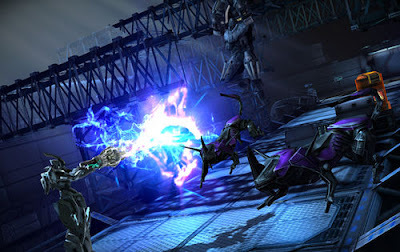 The action in Implosion takes place on your home planet earth where you and your team, armed with the War-Mech Series III battlesuit and other advanced weaponry, must battle the invaders to save the world and the human race. It's a pretty exciting hack and slash experience with a solid storyline, in the vein of Devil May Cry, that rivals the best console titles out there! What's even more exciting is that you can use our Modified Implosion Never Lose Hope apk to unlock all in-game content. As you may notice, there will be no need to purchase anything else with real cash as everything is in there. Please read the list below for the included mods. Just download the game (with sd data) and enjoy the full Implosion experience completely free! Unlock All Badge Rewards - Collect Them. Crimson Unlocked - Collect him from Badges. Massive Damage, Health, Rage, Shield, Hacker Level, Agility, Armor, Endurance, Massive Item Drop Rate. There are also many attacks you can fight with as well as many weapons. You can also take advantage of attack combos to cause the most damage and kill easily. Weapons range from sword(s), machine guns, but it's all about the suit which you can upgrade at will to suit combat needs. However, your combat skills are your most important assets so use them conveniently in order to pass the 34 stages. 1. Install PlayStore version of game. 3. Uninstall playstore version, OBB will stay because you renamed. 4. Download and Install my modded apk.